The Cherokee, who at the beginning of the eighteenth century numbered perhaps 17,000 people, originally lived along the Tennessee River in a region that probably extended from present-day Virginia down into present-day Georgia.Their situation, rarely a stable one thanks to a constant series of wars with their neighbors the Shawnee, the Creeks, and the Chickasaw, became more difficult with the arrival of the colonial powers. In 1738 a smallpox epidemic, brought to the Carolinas by the slave ships, killed thousands of Cherokee. A bewildering series of shifting alliances with the British, French and Spanish made many Indian nations pawns in the colonial game, and the Cherokee were no exception. In addition, encroachment on the traditional Cherokee lands by the new settlers forced a significant portion of the nation to move west and settle in present-day Arkansas, where, facing warfare with the local Osage and pressure from the U.S. government, one faction of the Cherokee moved down into Spanish Texas. At this turbulent point in history the Cherokee language was changed in a unique way by an utterly remarkable man. His English name was George Gist, or Guess. His Cherokee name was Sequoyah. 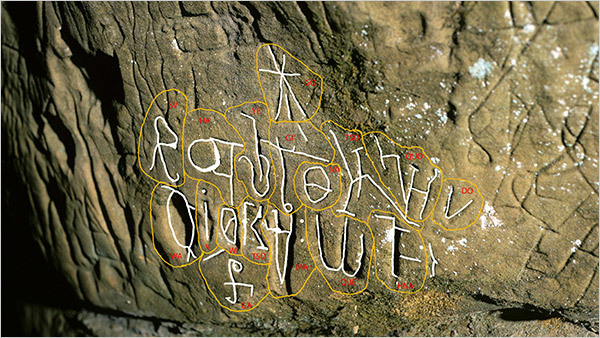 He was the first person we know who became literate by inventing his own writing system — and in the process brought literacy to an entire people. The facts of his life are not always clear or undisputed, but we can be reasonably sure of the following. He was born around 1770 in the former Cherokee village of Tuskegee on the Little Tennessee River — a village that now lies drowned beneath a reservoir. He was one of the Cherokee who moved west, and some time after the turn of the century Sequoyah, now in Arkansas, became increasingly aware of the fact that the whites could provide organized opposition over great distances by communicating using marks on paper. Why should the Cherokee not do the same? His own people ridiculed him at first, pointing out that no Indian language had ever been written down (and in fact writing was considered to be witchcraft by many Native peoples), but first by scratching marks with a nail and later using pen and paper, Sequoyah created a remarkably effective and suitable written version of his language. Rejecting the idea of coming up with a notation for every single word, which would require thousands of symbols, he broke words down into the most common syllables, or syllabic sounds, and created a set of symbols that would represent each of these syllables — a task made easier by the fact that every syllable in Cherokee ends with a vowel. He went through many trials and errors, working with such single-mindedness and in the face of such ridicule that his wife is said to have burned his cabin, or at least his papers, to try to get him to give up his linguistic labors and go back to doing some real work. When he gave the tribal council his first public demonstration in 1821, nobody believed he was actually reading, rather than just remembering random marks he had made. To prove his claims, he and his daughter Ahyoka were placed out of earshot of each other and separately given dictation — and then asked to read each other’s messages. When the test was successful, and Sequoyah subsequently taught a number of boys to read and write his new script, the Cherokee acquired literacy at a speed and with an eagerness possibly unmatched in history. 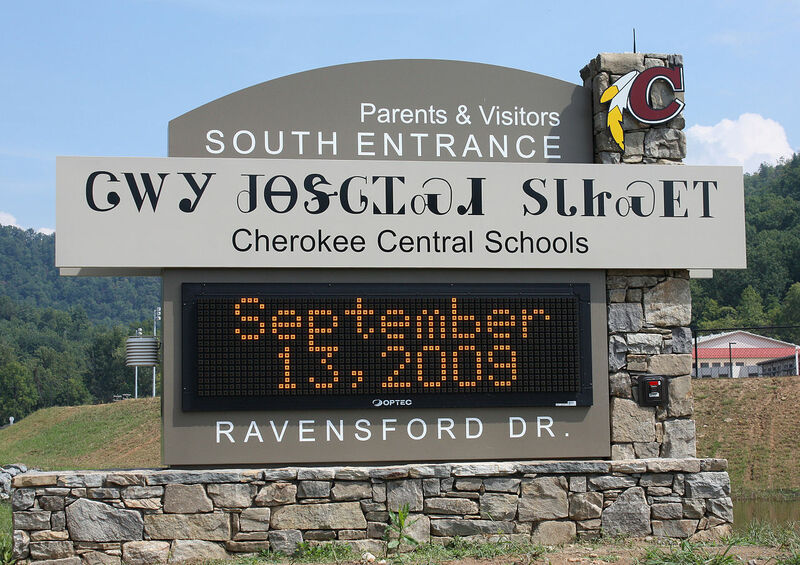 By 1830 70-90 percent of Cherokee could read and write their own language. It’s possible that in some areas of the U.S., the literacy rate among Cherokee was higher than among whites. 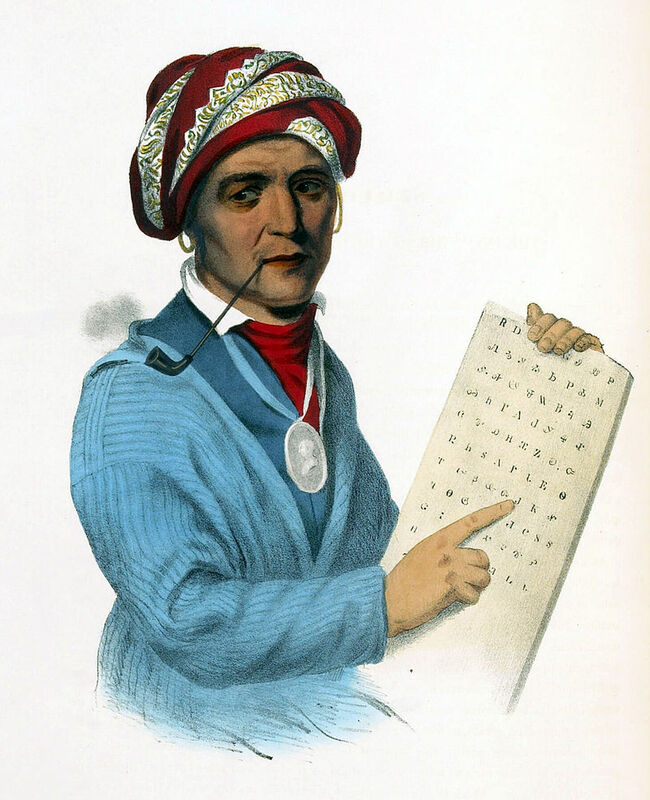 Sequoyah’s syllabary was an astonishing achievement, recognized by whites as well as Cherokee. When Congress invited each state to contribute two statues of prominent citizens for display, initially in the National Statuary Hall but now throughout the Capitol building, Oklahoma picked Sequoyah. Sequoyah’s efforts were helped by Samuel Worcester, a white missionary, and Elias Boudinot, a Cherokee Christian convert, along with other Cherokee including George Lowery and Charles Hicks. Worcester organized Cherokee into an alphabetical order, had type cast for it and set up a printing press. (He also later went to jail for a year, charged with civil disobedience, for opposing the deportation of the Cherokees.) Boudinot became the first editor, in 1828, of the Cherokee Phoenix, the first American Indian newspaper, with articles in Cherokee and English. At one point the newspaper’s circulation may have reached the astonishing figure of 3,000, and was read as far away as London. At this point of sudden flourishing, history intervened again. The Indian Removal Act of 1830 made it legal for Indian nations to be forcibly removed from their homelands and resettled farther west. The Choctaw were deported first, followed by the Creek, Seminole and Chickasaw nations. Realizing what lay ahead, the editor and staff of the Cherokee Phoenix tried to move the printing press to Tennessee, but “the notorious Georgia Guard was brutally keeping the Cherokee ‘under control,’” according to Larry Worthy, editor of About North Georgia. In 1838 some 7,000 militia and volunteers herded 13,000 Cherokee into what may have been the world’s first concentration camps, and then forced them to march a thousand miles west, in winter, to Oklahoma. Thousands died of disease, exposure and starvation. The survivors settled around Tahlequah. In another unfortunate twist, the Civil War divided and scattered the Cherokee Nation, which suffered proportionally the highest losses of any Indian nation. The victory of the Union forces, followed by the creation of the state of Oklahoma, meant the end of autonomous government for the Cherokee. 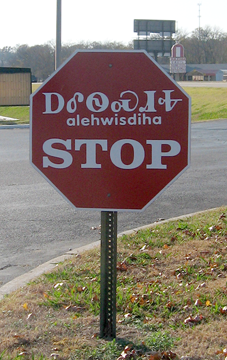 The Cherokee language and script declined, especially as many schools and local governments punished children for speaking Cherokee. The situation would not markedly improve for more than a century. The Cherokee revival of the late twentieth century saw increasing numbers of Cherokee, both the Eastern band in North Carolina and the western bands in Oklahoma, relearning their language and syllabary, reviving the Cherokee Phoenix with articles in both English and Cherokee, establishing immersion language classes for pre-K to sixth grade with a bridge program in seventh and eighth grades, setting up language committees to adapt the Cherokee language to modern needs, and uniquely incorporating the characters of the syllabary into the visual arts. 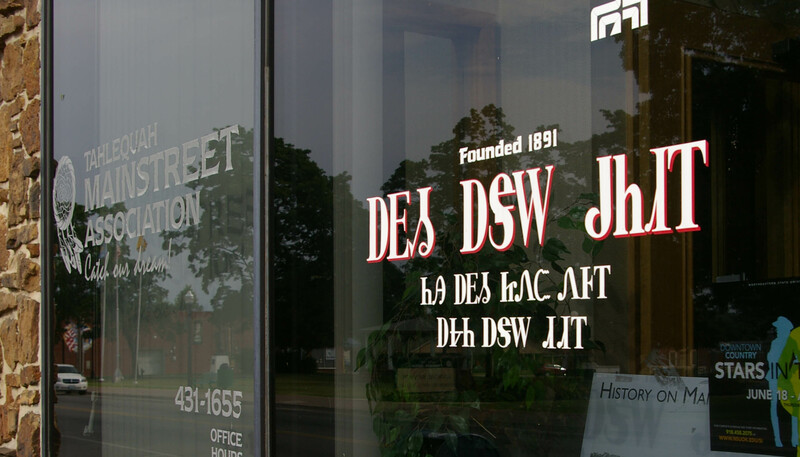 Other programs include the Cherokee Language Master Apprentice Program, the Cherokee Language Technology Program, and the Office of Translation. 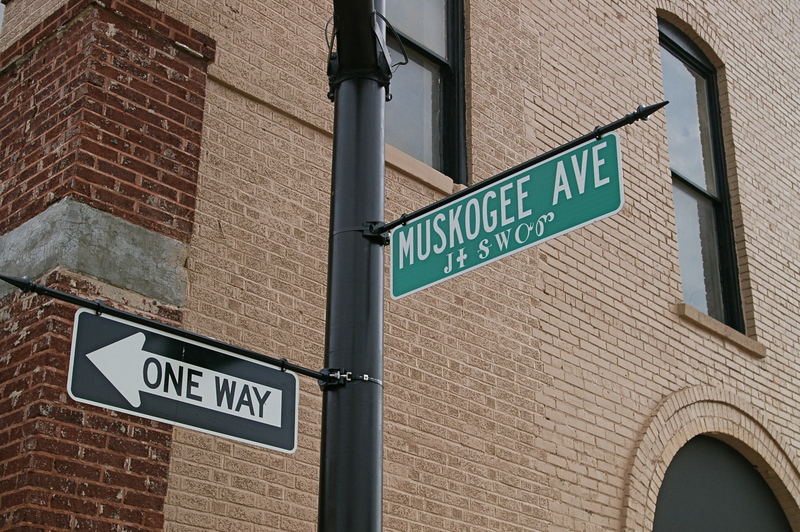 Courses in Cherokee language, history and culture are now offered at colleges and universities, especially in Oklahoma, and some of the street signs (and the post office) in Tahlequah have their signage in both English and the Cherokee syllabary. 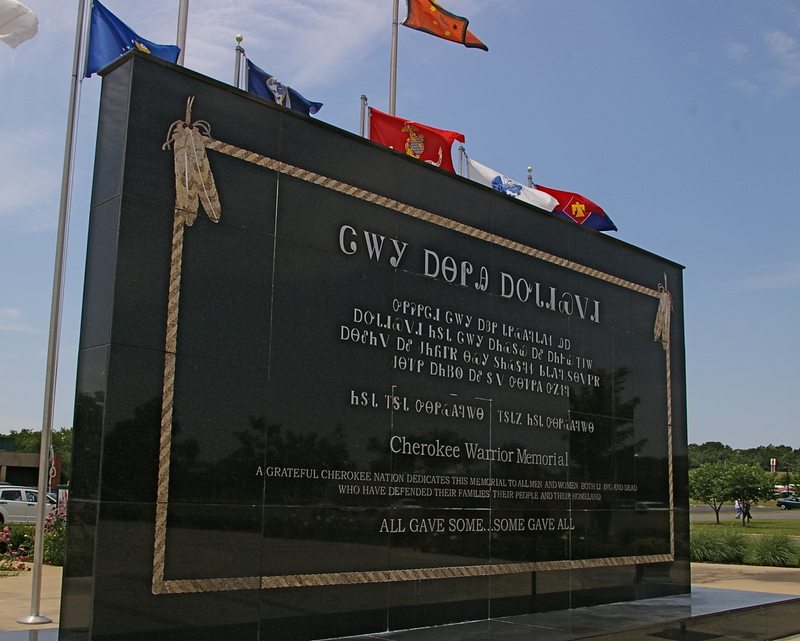 All the same, the vast majority of Cherokee can speak at most a few words of their language, and according to the Cherokee Heritage Center, only one in three or four Cherokee who can speak Cherokee reasonably well can also write it. 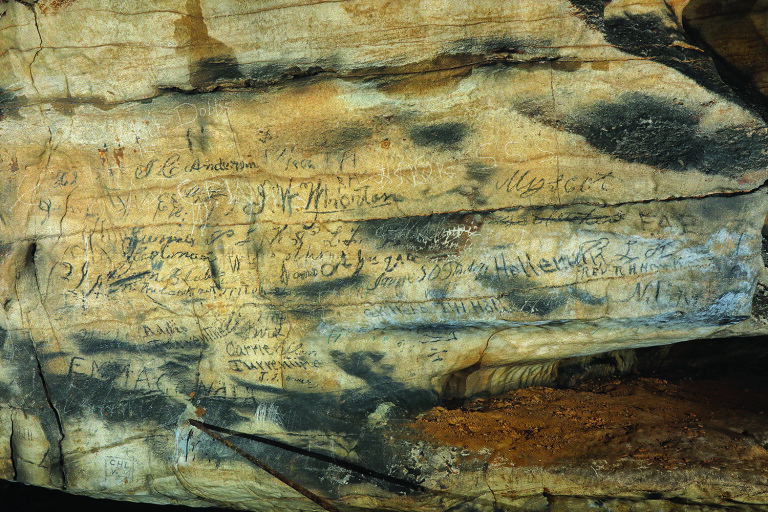 Nineteenth-century Cherokee inscriptions found in Manitou Cave near Fort Payne, Alabama. Photo: Alan Cressler.